Family Adventures in the Canadian Rockies: The Camping Project - 40+ Nights Baby! Yes, you read that title correctly. We are going to be camping over 40 nights this season between tonight and the end of September. 40 nights!! That's a LOT of camping. Thankfully, we bought a small trailer this winter and will transition to becoming a trailer-camping family starting this weekend. I am not saying we will be doing RV camping because the word RV makes me think of a motor-home/tour bus large enough for Bon Jovi, his band, and their family members. I guess I just don't like the word. I also want to be clear that this die-hard tenting family will still be seeking out natural campgrounds with outhouses, grass, and plenty of trees. I've booked us into one RV Park in the Okanagan but that's only because it is so incredibly crazy and hard to find a campsite there at a provincial park that I gave up and went the easy route. We will also be doing two backcountry trips this summer so we will not be selling our tent and will always make it a priority to include pure and true "sleep on the ground"style camping in our life. We haven't completely sold out to comfort or glamping. So, why am I calling this a camping project? For a few reasons. First, because I actually didn't really like camping until last summer. Sad but true. To read about my transformation read the story I wrote last summer about Finding Your Camping Style. Second, because our family has never, I repeat never, camped this much in one season! I have no idea in all honesty how it will work out. We found last year that between packing, unpacking, and planning for each weekend's upcoming camping trip, we only had precious one or two days in the week when we weren't thinking about the last or next weekend. We're seriously hoping the trailer helps with this!! We've already loaded it with many things that we would have had to pack up every Friday. We plan on doing a lot of bike hiking in the Paddy's Flat area and since the campground there is still closed, we'll be able to freely ride our bikes through the empty campground in complete safety. We'll also be able to bike the closed highway past Elbow Falls before it opens to traffic on the 15th. Yay for early spring biking! We are super excited about this trip because we had so much fun last year!! Follow the link above to read the story from last May when we went. We have booked the exact same string of sites this year and are expecting 10+ families to be camping with us. There are four other families joining us for this trip - all with kids under the age of 6! And while we adults won't be riding our bikes, the kids will all be on bikes for the 4km journey into the campground. It's going to be so much fun and we can't wait! I'm really hoping the Quaite Valley Trail is flat like this! 5-6 other families and we will again be staying at the Waterton Springs Campground. For information on the campground and to see photos from last year, follow the link above to the story from last July. This year we are hoping to tackle the Bear's Hump hike with no child carrier, are hoping our son will be biking on his own without the Chariot, and we'll be planning a paddling trip on Cameron Lake with my SUP and our canoe or soon to be purchased kayak. I know, all of our trips look like group trips but we've actually booked the whole Lower Lakes Group Campground for this one and have 13 families signed up so far to come. 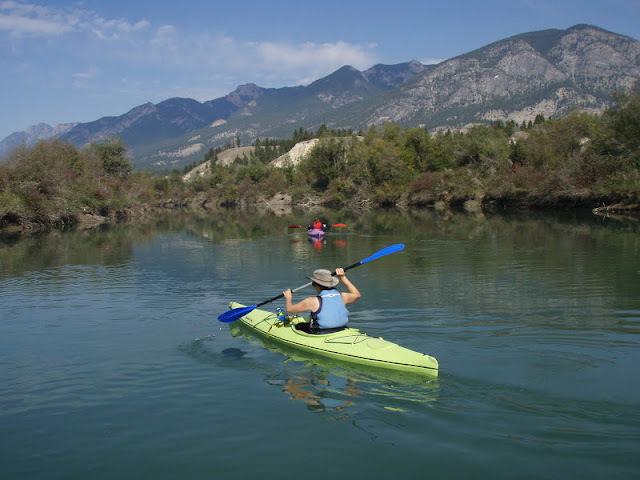 We are very excited to do lots of biking on the paved trails in PLPP, to do some bike hiking on the ski trails within the park, and to do some paddling on Lower Kananaskis Lake. If you see a crazy chick on the Lower Lake on a SUP, that will be me so wave and say hi. 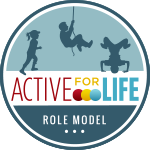 For more information about the park and what you can do there with kids, follow the link above to the story I wrote last summer. We haven't camped much in the National Parks here so we are going to remedy that with a week long camping trip in Banff and Jasper. We want to camp at Two Jack Lake in Banff, Waterfowl Lakes in Banff, and at Wapiti Campground in Jasper. 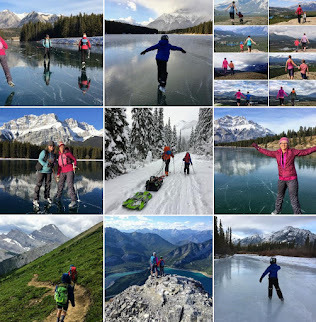 The big goal - to SUP and paddle as many lakes as we can in a week from Lake Louise, Moraine Lake, Two Jack Lake, Lake Minnewanka, Cascade Ponds, Johnson Lake, Bow Lake, and Waterfowl Lakes in Banff to Patricia Lake, Pyramid Lake, and Maligne Lake in Jasper. I have no idea if we'll actually get that all in but we're going to try. 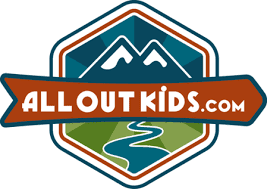 We are also excited to work with Travel Alberta to help promote First Summits with kids. We will be taking Noah up the Jasper tramway so that he can do his first hike to the top of Whistler's Summit. You'll hear lots about First Summits this summer as we tackle a handful of them to follow up Noah's success with Tunnel Mountain in Banff. 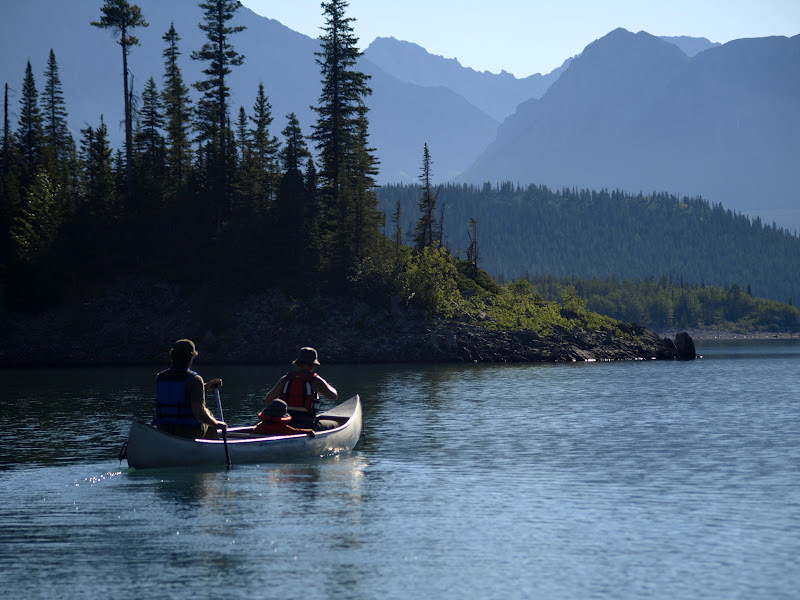 To read the story from last year's trip to the Point on Upper Kananaskis Lake, follow the link above on "Backcountry Family Paddling Trip". 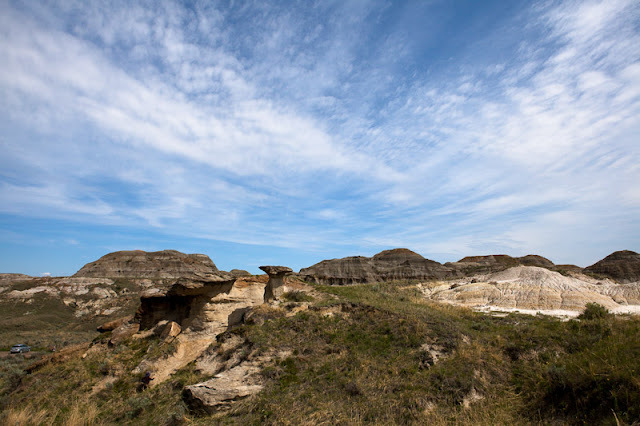 We've never visited this campground or provincial park but I hear that it's similar to Dinosaur Provincial Park so we are excited for more opportunities to hike around hoodoos and camp in the Badlands of Alberta. We also hope to paddle the Milk River while there which is a spectacular opportunity for paddlers! We have another group campground booked for this one and 8 families coming with us. We always take a road trip to BC in the summer but we have never spent the whole two weeks camping before. Usually we stay in motels or do a combo trip of motels and camping. This year it is 100% camping for 16 nights! That's a long time. I hope there are showers in some of the campgrounds! We plan to head first to a new destination for us - Champion Lakes, in the Selkirk mountains. 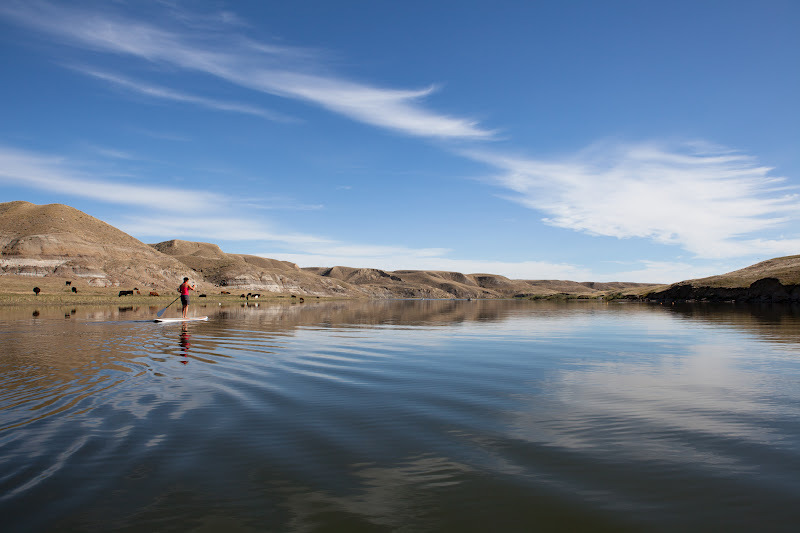 We chose this location because of the paddling opportunities on lakes that do not allow motor boats. Yay - no motor boats to create waves to knock me off my board! We follow that up with 5 nights in the Okanagan based out of Peachland. We plan to spend tons of time on the beaches of Skaha and Okanagan Lake and we will have a blissfully content child! That's as far as is currently booked but we hope to end the trip with some time in the Shuswap region of BC. Let me know if you have a favourite campground there. We'll round out the camping season with a trip to one of our favourite valleys - the Columbia Valley so that we can do a family friendly paddling trip on the Columbia River. We also want to explore some natural hotsprings, do some hiking, and tour around on our bikes. We haven't stayed at the Red Streak Campground in years so we have decided to make that our home base in Radium Hotsprings, conveniently located up the hill from the actual hotsprings. 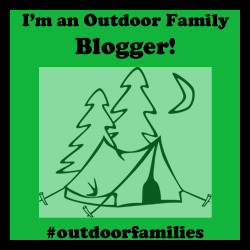 I hope you'll follow us on our camping adventures this season and wish us luck with our Camping Project. If you would like to sponsor the Camping Project with a camping-themed giveaway or review please contact me. I am pleased to announce that we will be working with ENO hammocks this summer - and there's a hammock giveaway coming your way soon so keep tuned for that! You know you want a super sweet and light hammock that you can take backpacking with you! And so, I leave you because Camping Season begins in 2 hours! And I still have packing to do. Special thanks to Dad Camp for inspiration in writing about my Camping Project Schedule. Sounds like my kind of Mother's Day, Tanya! Enjoy! Thanks Debbie. It was a great way to spend Mother's Day. wow you are so organised. If you are coming to the Okanagan on Hwy 1 I have a great hike for you, Gorge Creek. here is a link with some pictures, http://cachehowndsadventures.wordpress.com/2013/05/13/998/ My 3 (almost 4) year old did it with no problem. It is not bike friendly. If your looking for any other hike in the Kelowna area I might be able to point you to some, although hanging out at the beach is just as much fun in the summer. Thanks Jeanne. We actually won't be on the main Hwy 1 this time as we are doing a big loop. I will book mark that hike though for the future. If we can bring our bikes with us in addition to everything else, we might try to bike some of the KVR. Before heading up to the KVR make sure it is all open. With all the rain we had a fews ago, caused a rock slide and has really damaged one of the trestles. Thanks for the head's up. I don't imagine we'd bike too far so even going to the second trestle and back from Ruth would be good enough for my kid on his balance bike. Thanks. I'll check back on conditions before we go. Sad about the third trestle.